It's spring and there's a ton of easter crafting to do in my house. Tons of egg hunts are on the horizon and my kids' baskets from the dollar store were in need of some of my creative touches. After adding their names, it still needed something. I thought what's cuter than adding some bunny tails, which to my surprise, I haven't been able to find in store yet. I knew I had a roll of white yarn left over in my craft stash and opted for a pom-pom version. It was just enough to make two fluffy ones. Unroll a few inches of the yarn roll. Tie a knot on the end of the strand. and place the knot between the long edge of the rolls. I clipped my ends together with clothespins for extra security. Begin wrapping the yarn around the rolls. Keep wrapping until you are satisfied with the thickness, which was about half my yarn roll. If you have a thicker yarn or using multiple colors you will not have to wrap as many times around. Snip yarn when finished. Slide out the rolls, making any adjustments if necessary before tieing the middle of the yarn tight and knotting. Snip all the loops and give it a shake. Make a hole in one pringle lid. Slide the long piece of yarn (used to tie the middle of your pom-pom) through the hole. Flatten and sandwich between the other lid. Cut around the lid, trim the longer pieces. Remove lids and give a shake. Turn the pom-pom to its side and sandwich it again. Cut around the lid again and trim the excess. It's up to you whether or not to trim the long middle piece. Another shake for a final check and trim any strays. And that's all! You should have a fluffy, medium-sized pom-pom! 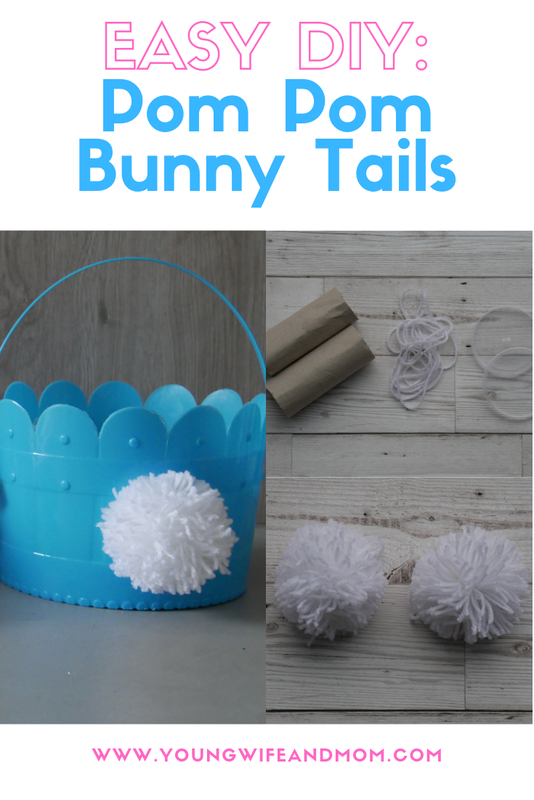 I attached my pom-poms to the back of my kids Easter baskets as bunny tails but you could use these for anything. For the rest of the instructions on how I turned some dollar store baskets into these cuties, check out my post here.